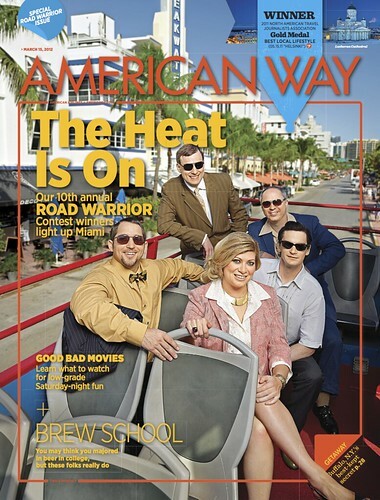 American Way Magazine is located in the seat pocket in front of you on every American Airlines flight, and in the latest issue they profile the winners in the 2011 Road Warrior contest. Neal Gottlieb, of Sausalito, CA, was the Grand-Prize Winner. He traveled a total 101,854 miles last year as co-owner and founding twin of Three Twins Ice Cream (if you’re not familiar with Three Twins, they make an incredible lemon cookie ice cream that’s, thankfully, not available in Dallas, otherwise I’d be 500 pounds). With all of your travels, we know you’ve gathered some great insider tips about cities around the world. Share them with our Road Warrior Community for your chance to win 100,000 AAdvantnage Miles! After registering for the Road Warrior Community you will be able to build an itinerary and write a review of your favorite restaurants, hotels, bars, and other attractions. Sweepstakes offered only in the U.S., and is open only to legal residents of the 50 United States, the District of Columbia, and Puerto Rico who are 18 years of age or older at the time of entry. Entrants must either create an online itinerary or leave a review in order to be eligible to win the Grand Prize. The deadline to enter is September 14, 2012 at 11:59 pm CDT. Go here for terms and conditions and to enter. Good luck! Hi Gary – I mentioned it in “from the rules”: $1,990.00.